You can expect THREE coupon inserts in Sunday's paper. One from Smartsource, Red Plum and P&G. Remember, coupons and inserts do vary by region. Just a heads up that the Fulton Street Farmers Market in Grand Rapids opens up tomorrow, May 1st. The market runs Tuesday, Wednesday, Friday and Saturday from now until Christmas! Check it out for lots of fresh locally grown fruits and veggies. More info HERE. So sorry for the lack of posts this week. With a part time job, toddler, meetings, walking every night and relatives in town its been busy at Grand Rapids Thrifty Mom's house. Stay tuned for more posts this weekend. Take this coupon HERE with you to VS and score a free Beauty Rush Lip Gloss with ANY purchase. Valid until May 26. 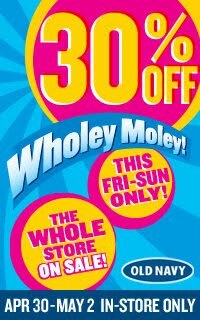 If you are planning on shopping this weekend, make sure and check out Old Navy for their Wholey Moley sale-30% off everything in store. Good this Friday -Sunday ONLY. If you are looking for organic coupons, Earth Fare has a bunch of printables on their website. These are manufacturer coupons so you can use them at ANY store. Check out the coupons HERE. 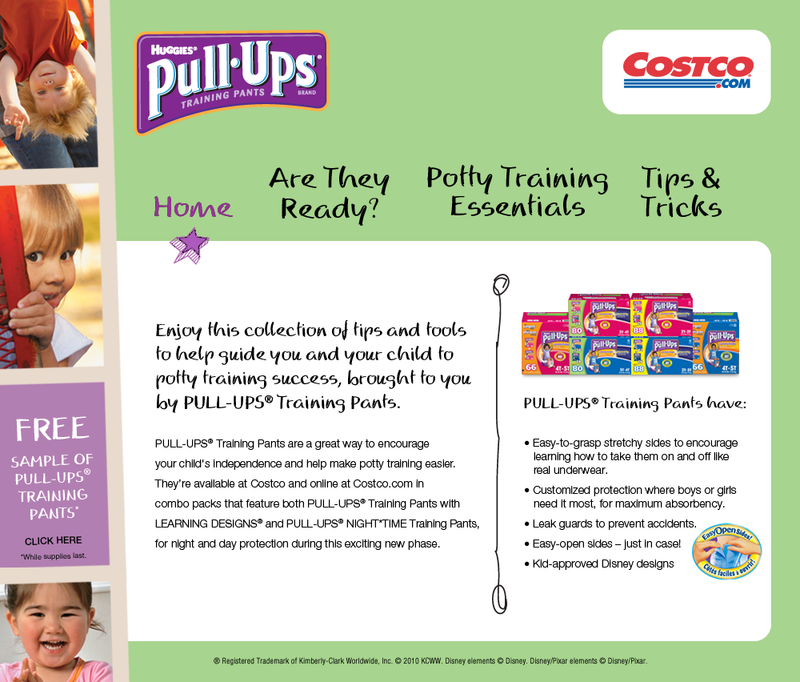 You can request a sample of Pull Ups HERE. This is a new link, so if you requested one before you can again. Baskin Robbins is offering $.31 scoops of ice cream tomorrow. Join us for 31 Cent Scoop Night at Baskin-Robbins and help us honor America's firefighters. The Baskin-Robbins Community Foundation is donating $100,000 to the National Fallen Firefighters Foundation™ (NFFF). Did you see the piece on NBC Nightly News tonight about couponing? I was out walking tonight and my husband saw it and recorded it for me(he is starting to really get into this as well.) We watched it together and he was just amazed. Feel free to watch the two videos above. What stores do you typically shop at? A certain day you prefer? How much do you typically save per week? The 10 oz. Palmolive Pure+Clear dish soap is 10% off at Target this week, making it $1.32. Coupons.com has released a bunch of high value coupons for pets. Remember, you can print 2 coupons per computer. Pair them up with sale items at Petsmart and get them for free!! Go HERE to request a sample of Renu Sensitive Contact Lens solution. Make sure and check out the freebies at Rite Aid this week!! (See post below). Final Price $3.00 or $1.50 each! Not a great week at Meijer for coupons as its the Meijer brand sale. Starting tomorrow, April 25, Walgreens will have the new May coupon book out. It will be located right by the weekly ads at the front of the store. Over $330 worth of savings in Walgreens coupons. Remember you can combine Walgreens coupons with manufacturer coupons. Remember to pick up the booklet! Caress Body Wash Sample-3 to choose from! Go HERE to request a sample of Caress Body Wash. You can choose from: Caress Whipped Soufflé, Caress White Peach Cream or Caress Whipped Soufflé Blackberry Cream. Hurry! This will go fast! You can expect two coupon inserts in Sunday's paper. One from Smartsource and one from Redplum. Remember, coupons and inserts do vary by region. 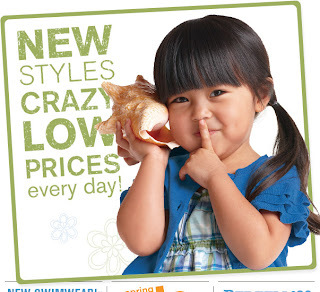 Sign up HERE to receive a Mambo Sprouts Coupon book full of savings on organic groceries. Plus a bunch more! 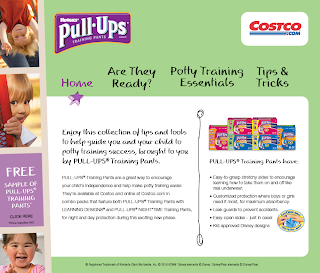 You can also find printable coupon on the website. 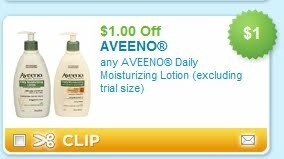 Starting this Sunday April 25, you can purchase Aveeno lotion for $.49 each after coupons. Make sure and hit up the Super Sale at Meijer this weekend!!! I did two seperate transactions to get the $3 off coupon from the 100 calorie cheese bites to use towards order #2 as well as the limit of two on the Green Works. 4 Capri Sun Roaring Waters-free when you bought Mac and Cheese! Super Sale is this Friday and Saturday at Meijer. The best values, however, are from the $5 off 5 item promotion!!! Buy 5 items, get $5off. You can mix and match and $1 off each item will be deducted instantly at checkout and will be listed on your receipt under each item purchased. Maximum of 2 offers per purchase, so 10 items=$10 off. $.49 for 5 pack, plus look for free Capri Sun Roaring Waters juicebox coupon on package for free packages of juice. You can request the newest Home Made Simple Coupon Book. 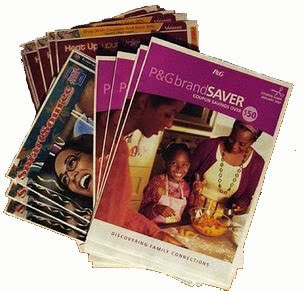 It is full of coupons for P&G products: Mr. Clean, Swiffer, Cascade, etc. Simply click HERE and then click on the "save now" button which will take you to the Home Made Simple website. Its a great week of deal shopping at Meijer, but I just realized today how good of a deal the Green Works products are this week at Meijer as well. The cleaning products are 20% off PLUS $1 off one instantly at the register(When you buy 2, limit one offer per transaction). 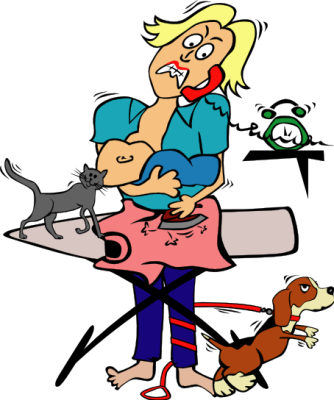 Add coupons and mealbox coupons and get very cheap cleaning products..think $.25 each depending on product!!! Savingsaddiction.com did a great breakdown of coupons needed. Check out all the info HERE. 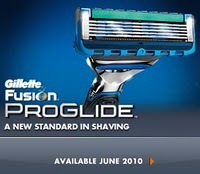 Starting today, you can get a free Gillette Fusion Razor .Only 1000 razors will be given away each day until May 1st. Go to the Facebook page for more info on how to enter HERE. All the razors for today have been given away, so check back tomorrow. 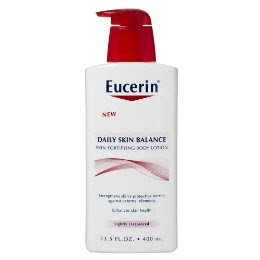 Go HERE to request a sample of Eucerin Body Lotion from Walmart. Moo.com is offering 50 FREE business cards to Etsy sellers. 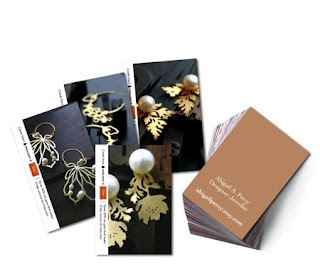 You can upload pics of your Etsy creations to use on your business cards. Check out all the details HERE. If you need fabric, check out this 50% off coupon for Jo-Ann Fabric stores. Valid through April 24. Go HERE to print out the coupon. If you are a member of Kraft First Taste, make sure and check your account. They are offering coupons for a free Oscer Meyer Turkey Bacon. Go HERE to sign in or to sign up for an account. In the past I've received coupons for Digornio pizza, Philadelphia cream cheese and Oreo Cakesters-full size products for free! If you plan on going to garage sales this upcoming weekend, make sure and stop at the Grand Rapids YMCA White Elephant Sale. All profits from this sale go to support Camp Manitou-Lin. Find more info and driving directions HERE. 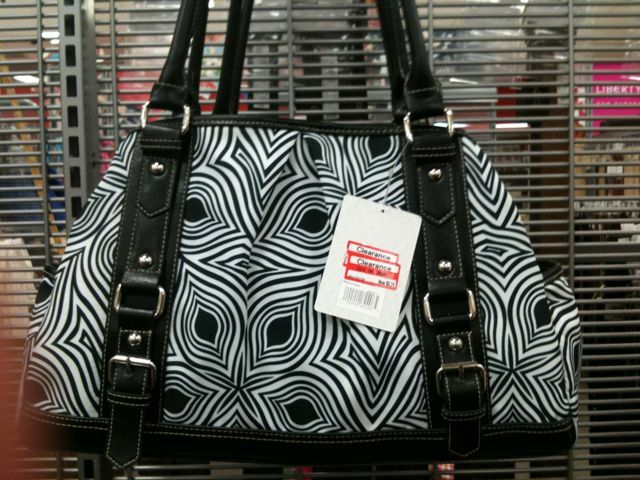 Along with the Merona polo shirt coupons, Target also released a $5 off Merona handbag coupon as well HERE. There might be several Merona handbags on clearance at your store this week. 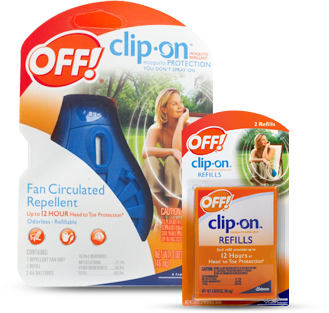 Bloggers are reporting them on clearance for $6.24 or $5, so cheap and free after coupon. The Frugal Find posted pics of the handbags on her blog HERE. Cute bags for summer, the beach, etc. Remember clearance items, prices, etc do vary by store. However, this coupon is good for a while, so you may be able to find different styles in the future. 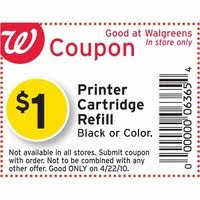 In honor of Earth Day, Walgreens is offering print ink cartridge refills for $1 each (regular price $12.99 each) on Thursday April 22. You must bring in the in-ad coupon to get it for this price or print out the coupon HERE. To find a list of participating stores and cartridge models go HERE. Coupon does not state a limit on cartridges, so you should be able to do more than one. 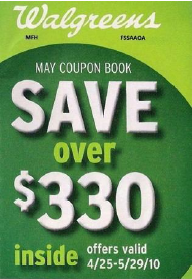 With all the coupons I print, this is such a great deal! 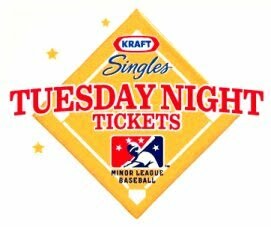 Kraft is offering B1G1 Free Minor League Baseball tickets again this season. All you have to do is bring a Kraft Cheese wrapper to the box office on any Tuesday night Minor League home game to get a FREE ticket when you buy one. Offer valid from now ’til Sept. 7, 2010. See a list HERE of participating games and more info. Leap Frog Fridge Toys are 50% off at Toys R Us this week, making them around $9.99 each. 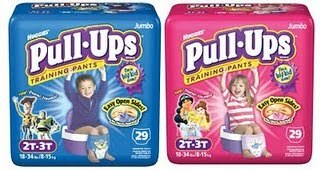 Use the $5 off coupon HERE (login or register at Leapfrog) to get them for $4.99. Not bad for a $19.99 toy! Target released a great coupon-$3 off Merona men's apparel item. Find the coupon HERE. 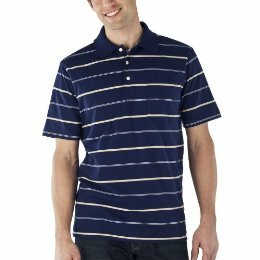 This week, Target has mens Merona classic fit jersey polos for $8, so $5 after coupon. You can also use the above coupon on any Merona item on sale or clearance! Go HERE to request a sample of John Frieda Root Awakening from Walmart. Crazy 8 Children's Store is having their official grand opening this weekend at Rivertown Crossings Mall in Grandville. Crazy 8 is owned by Gymboree and is more afforable. The store is located by Children's Place in the mall and is celebrating Friday-Sunday April 18. The first 1000 people through the door get a $10 off $30 coupon. The store also is having giveaways. Find more info HERE. Just a reminder that this is the last weekend of the Carters Warehouse Sale. See post HERE. 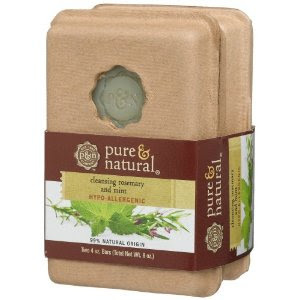 Go HERE to print off a $2.00/1 coupon for Pure and Natural Soap. If you have the$3 off VV(video values) coupon from March, it will make the soap free!